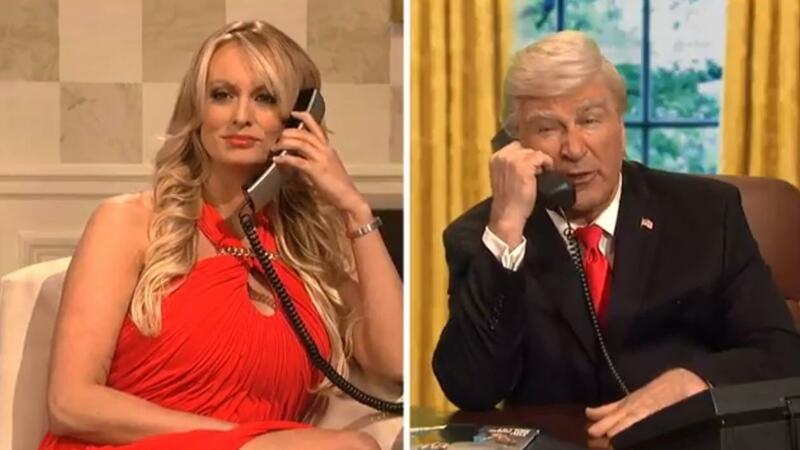 Calling the White House from a pay phone, Cohen tells Trump, played as usual by Alec Baldwin, "Mr. Trump, I don't know what to do, you keep changing your story on the Stormy Daniels payment!" "Look, let's get Rudy Giuliani on the phone, he'll fix this, he's got the sharpest legal mind since My Cousin Vinny," Baldwin's Trump says. Cohen then makes a series of wrong calls to, and receives calls from, members of the Trump orbit — including Martin Short as the doctor who wrote a 2015 statement (which he now says Trump dictated) that Trump would be "the healthiest individual ever elected to the presidency," Dr. Harold Bornstein; Kate McKinnon as Giuliani, who said on Fox News this past week that Trump reimbursed Cohen for paying off Daniels; Scarlett Johansson and Jimmy Fallon as Ivanka Trump and Jared Kushner, upset after the real Giuliani called Kushner "disposable" in the same Fox News interview; plus brief appearances by Leslie Jones as Omarosa Manigault; Aidy Bryant as Sarah Sanders; Cecily Strong as Melania Trump; and Beck Bennett as Vice President Pence. Finally, Trump gets on the phone with Daniels, who tells him at one point, "I know you don't believe in climate change, but a storm's a-coming, baby."